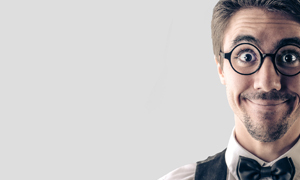 Promutuel Insurance Chaudière-Appalaches: we insure you better. 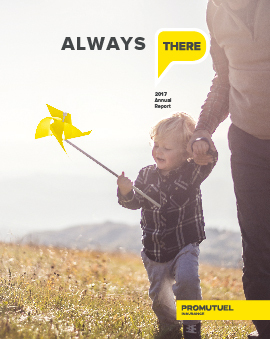 We've been insuring people in Laurier-Station, Beauceville, Lévis, Plessisville, Saint-Georges, Sainte Marie and Thetford Mines for so long, we know your needs better than anyone. That's why we can offer you the best home, car, recreational vehicle, business or farm coverage for your budget. Welcome to Promutuel Insurance, your home away from home! 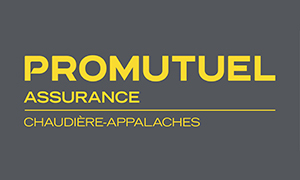 Insured members of Promutuel Insurance Chaudière-Appalaches are invited to its general meetings to be held Sunday, March 17, 2019, at 10 a.m., at the Mont Granit conference room, located at 912, chemin du Mont-Granit Ouest, Thetford Mines. A brunch will be served after the meeting. We hope that many of you will be able to attend these meetings! Please consult the meeting notice (french only). Insured members of Promutuel Insurance Chaudière-Appalaches are invited to its annual general meeting to be held Sunday, March 18, 2018, at 10 a.m., at La Cache à Maxime, 265, Drouin Street, Scott. A brunch will be served after the meeting, and a children’s area will be provided. We hope that many of you will join us for this event! Please consult the meeting notice (french only). Promutuel Insurance Chaudière-Appalaches is pleased to announce the first winner of its “Take a Payment Holiday for 1 Year” contest. Congratulations to Grimard et Fils, a local business in Fortierville! To be automatically entered in the contest, insured members simply need to complete a customer satisfaction survey after a claim is settled. The insured members of Promutuel Insurance Chaudière-Appalaches are invited to the AGM on March 19, 2017, at 10 a.m., at the Complexe des Seigneuries, 1080, avenue Bergeron, Saint-Agapit. We hope to see many of you there! Please consult the meeting notice (French only). Promutuel Insurance Chaudière-Appalaches is proud to debut a new program that rewards insured members who recommend Promutuel to a friend. For each person you refer who completes a quote, you’ll get $15. And guess what? There’s no limit! Take advantage of this offer today and share it on your social media. 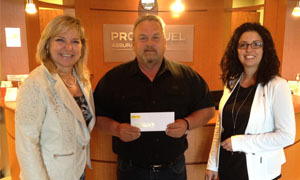 Congratulations to Alain Boucher, winner of our “We’re Renewing with Promutuel Insurance” Contest! 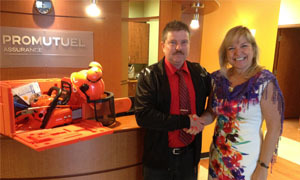 Alain was selected from among all contest entrants as the winner of our $1,000 prize in our random draw on May 16. To everyone who entered, thanks for your trust in Promutuel Insurance Chaudière-Appalaches! Congratulations to Eric Champagne, who won a chain saw kit valued at over $800! 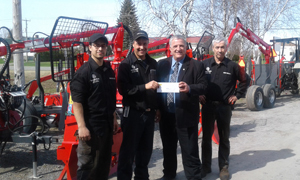 The contest was held at the farm and forestry show in Saint-Odilon, May 28 and 29, 2016. To enter, participants were invited to fill out a coupon at the Promutuel Insurance booth. 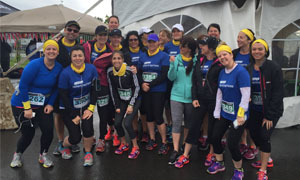 Congratulations to the employees who braved the cold on Sunday, June 12, for Défi Entreprises Québec 2016! The event held at ExpoCité raised over $25,000 for Fondation de l'Institut universitaire de cardiologie et de pneumologie de Québec. Say hello to Promutuel Insurance Chaudière-Appalaches! On May 2, 2016, Promutuel Insurance Appalaches–St-François, Promutuel Insurance Beauce-Etchemins, and Promutuel Insurance Lotbinière concluded a merger to officially become Promutuel Insurance Chaudière-Appalaches. The head office of the new mutual will be located in Laurier-Station. 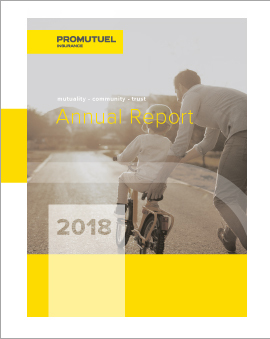 "The merger of these three mutuals will allow Promutuel Insurance Chaudière-Appalaches to boost its operations and be a strong organization ready to face the competition thanks to first-rate capitalization and greater growth capacity," states Anne Vaillancourt, general manager of the new mutual. 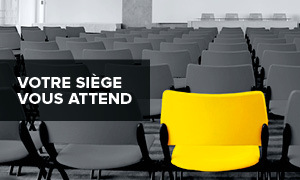 We are inviting our insured members to an Extraordinary General Meeting on February 18, 2016, to discuss our planned merger with Promutuel Insurance Appalaches – St-François and Promutuel Insurance Beauce-Etchemins. This is an important step in bringing our operations together under one roof. We hope that many of you will be able to attend this important meeting about the future of our Mutual. You can view the meeting notice here (French only). Promutuel Insurance Chaudière-Appalaches upholds the values of solidarity and cooperation that underpin its operations and its commitment to the community. 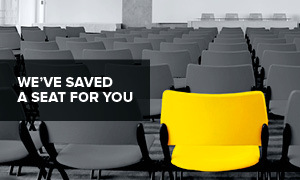 Its mission as a sustainable and innovative mutual insurer is to protect its insured members. Officially created on May 2, 2016, Promutuel Insurance Chaudière-Appalaches is a result of the merger of Promutuel Insurance Appalaches-St-François, Promutuel Insurance Beauce-Etchemins, and Promutuel Insurance Lotbinière. This merger promises a bright future. It ensures the long-term survival of the mutual and makes it more viable on a highly competitive market. The mutual's head office is in Laurier-Station. To serve all its insured members throughout the merged territories, it also has offices in Thetford Mines, Plessisville, Beauceville, Saint-Georges, Sainte-Marie, and Lévis. Promutuel Insurance Appalaches–St-François had a rich history that began in Lyster Station in 1906. Some 70 years later, this fire insurance company for the counties of Lotbinière and Mégantic fused with Mutuelle de Saint-Pierre-Baptiste. Then, between 1979 and 1981, the mutuals of the parishes of Sacré-Cœur-de-Marie, Saint-Jacques-de-Leeds, and Saint-Méthode d'Adstock joined to form Société mutuelle d'assurance générale des Appalaches, a new entity as of 1987. 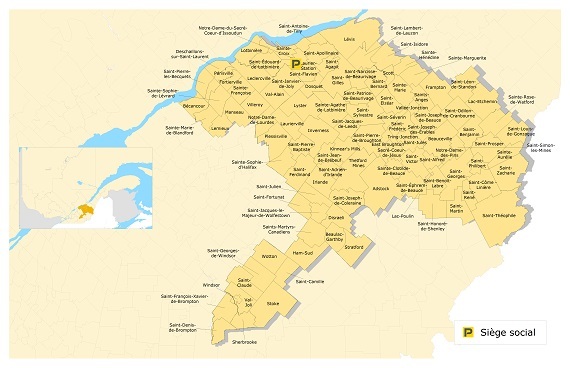 In 2001, the company's territory doubled in size with the addition of part of the territory of Promutuel Val St-François, which includes some 20,000 members in the regions of Amiante, Érable, and Val-Saint-François. In the early 20th century, convinced of the benefits of solidarity and cooperation, farmers came together to insure their property while avoiding the exorbitant premiums charged by the insurance companies of the day. This laid the early foundations of mutual insurance companies offering coverage against fire, lighting, and wind in a number of locations across the Beauce region. This territory stretches from Sainte-Marie to the U.S. border, with a western annex that includes the township of Broughton. In December 1979, 13 Beauce region mutual insurance companies merged into a single institution to become Société mutuelle d’assurance contre l’incendie de Beauce , which then became Promutuel Insurance Beauce in 1985, then Promutuel Insurance Beauce-Etchemins in 2009. Originally, the signs of three different mutuals hung in the parishes of Sainte-Croix, Saint-Patrice-de-Beaurivage, and Saint-Louis-Lotbinière. The combined strengths of these entities established and lent credibility to a major regional insurer, Promutuel Lotbinière. This organization stood out from the competition by continuing the mutualist tradition. To optimize its growth, Promutuel Insurance Lotbinière acquired clients from brokerage firms within its territory. Promutuel Assurance Chaudière-Appalaches has a reputation for financial solidity, excellent service and quality products. We create jobs and invest capital in our region, contributing to the well-being of organizations and people in our community. Promutuel Assurance Chaudière-Appalaches is a stimulating and challenging work environment. 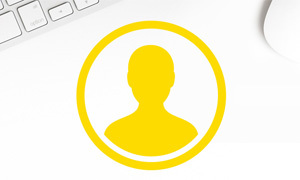 Are you a competent, versatile and dynamic person? Are you ready to share our pride and take up future challenges with us? Promutuel Assurance Chaudière-Appalaches offers many career opportunities in a range of sectors, all located in the heart of our region. 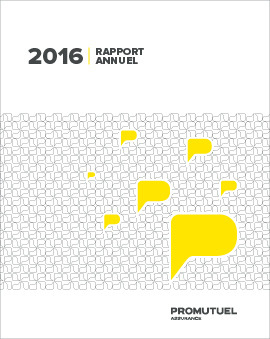 Promutuel Assurance Chaudière-Appalaches is an equal opportunity employer. All correspondence will remain confidential.